Each month, we interview a Socialite Influencer, one of our members who has shown exceptional skill at marketing her business in the interior design, home staging, or workroom spaces. We cover the emotional, strategic, educational, and brand-based facets of running a business in the fast-paced home industry. How long have you been working in the home industry? 10 years on my own. A house is a place, but home is a feeling. I live with my husband and sons in rural southeastern Pennsylvania in an imperfectly-perfect Victorian farmhouse. Filled with joys of the past, and memories yet to be created, it is my very own palace. Since I was little, I dreamed of living in the huge castle of fairy tale nostalgia, complete with its grand architecture, moat, and a drawbridge. Far from royalty, I grew up running barefoot through the fields and woods of upstate New York, watching the paddle boats steam down the Mississippi River, riding bikes in the Kansas dust, climbing trees in Pennsylvania, and building secret childhood forts in Delaware. All in all, I experienced 13 moves and 7 states before the age of 16. While my travels have made me who I am today, the feeling I get from that mental castle image and that sense of home has stayed with me my whole life. I believe houses are living, breathing entities, and are a direct reflection of who we are as people, and who we can become. We don’t need to live in a castle to feel safe, content, empowered, or beautiful. We just have to be willing to listen to what our heart and memories tell us about how to meet our deepest needs for home. I work with people who are ready to uncover their innermost designer and create an energized space that is truly personal - a place that welcomes our whole selves just as we are and supports us in becoming the very best versions of ourselves. When you first started your business, how confident were you? I was just excited to learn all that I could. About a year into business I realized that I was capable of doing this job. It wasn’t until recently when I revamped my business to create a new brand (The Enlightened Nest) that my confidence in delivering the best client experience possible was fading. That was the push I needed to get my new brand up and running to not only meet my customer’s needs, but my needs to grow and expand along with my life’s purpose. What fears did you have as a new business owner in the home industry? All of the things!! I’ve made more financial mistakes than I can count. But each one has been a learning experience and I’ve come out better for them. My deepest fear is having a client upset with me or my service. Facing these fears has forced me to develop a courage I didn’t know I had. What part of your experience or education helped you grow your business? How have you grown as a person since, and because of, starting your business? I’ve been forced to look at my deepest fears- the ones I refuse to let anyone see- and face them out in the open. Once I acknowledged they were real, it was much easier to make a plan to address them as they came up. Things like client confrontation, or money battles, or putting myself outside of my comfort zone. It used to be that my fears of those scenarios would sideswipe or sabotage me before I even gave myself a chance. Don’t get me wrong, those things still scare me. But now I make a conscious effort to acknowledge they exist and navigate around them. If you could give yourself (and any other new business owners in the home industry) a piece of advice, what would you say? Do you have a business mentor or idol? My mother was such a huge influence on my life. I always think about what she would have done in any given situation. She was a strong woman with unwavering dedication to her family and the people she served in her career. What is the #1 problem you seek to solve for your clients? I help them achieve their life goals and become the best version of themselves that they can be by helping them create a home that will nurture and sustain them as they work towards accomplishing their dreams. What type of project brings you the most joy? Working one on one with customers to learn what truly brings joy to their lives so that I can help recreate that in tangible form. How do you spot and avoid a potentially ill-fitting client? I work really hard to market to my tribe of people so I don’t often run into clients who aren’t a good fit. However, if it does happen I generally do a phone call to assess their expectations and make sure we are a good fit. How do you handle people who say, "You're too expensive" and expect a discount? In what ways have you intentionally set yourself apart from competitors? I have branded a completely different method for the interior design process. It is more like a series of in-depth one on one sessions over several weeks to really get to the heart of the client’s deepest needs for home. What is your big dream or goal for your business within the next 5 years? I’d like to become a leader in the field of design psychology as it pertains to residential design, and be able to help people fulfill their own dreams by helping them create their personal soul-nourishing home. What is the biggest marketing mistake you've ever made? Buying print ads in magazines for exorbitant fees. Never once got a client from those ads. It was easy to get caught up in the sales pitch of a good ROI, but the reality is that I had no way of connecting emotionally with potential buyers when I was lumped in with and next all of these other ads from other businesses. What is one marketing tactic you use now that you wish you had used "back in the day"? My monthly newsletter. It is a Great War for me to stay in touch with past and future customers with very little effort. It keeps me “top of mind” for them when they are ready to start a project. I’ve had several past clients contact me to start new projects after sending out a newsletter. They get the mail in their inbox and it reminds them that they’ve been meaning to call me. What is your favorite way to market your business? Honestly? Letting someone else do it for me. I am not gifted with a skill set in marketing. It’s one thing I’ve realized - that I can hire someone else to do it way better and faster than I can, which frees me up to do what I love. 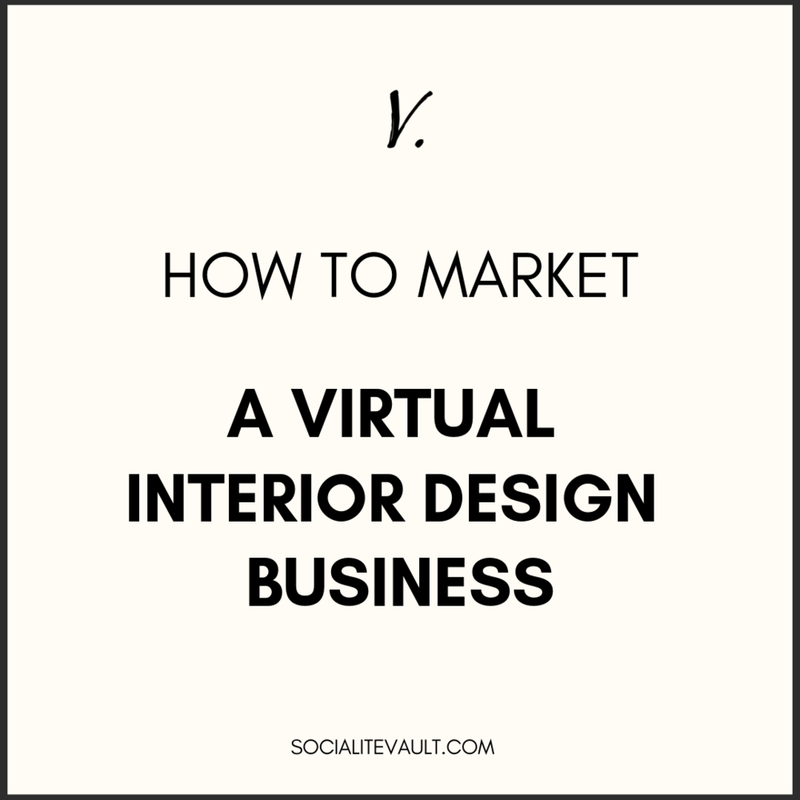 How do you use Socialite Vault to help market your business in the home industry? If a new business owner wanted to contact you for advice, how can they go about doing that? Socialite Vault is marketing platform for interior designers, home stagers, and workrooms. Start a 14 day trial by clicking here.